This work seeks to provide in one volume all the essential information to learn and master six of the main religions: Judaism; Christianity; Islam; Hinduism; Buddhism; and Sikhism. It is a complete, self contained, illustrated course for individual study or classroom use, which should help students to pass exams. It is suitable for GCSE and also as an introduction to A Level. 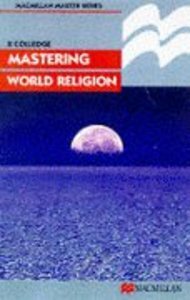 The text is also particulary suitable for general reading for anyone who wants to understand the basic beliefs and practices of the religions featured. - Publisher This is a guide to the six main religions, Judaism, Christianity, Islam, Hinduism, Buddhism and Sikhism, which forms a self-contained course for individual study or classroom use, which is suitable for GCSE or as an introduction to A-Level. This is a guide to the six main religions, Judaism, Christianity, Islam, Hinduism, Buddhism and Sikhism, which forms a self-contained course for individual study or classroom use, which is suitable for GCSE or as an introduction to A-Level.